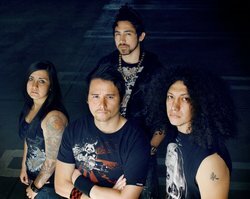 Initially launching into the underground music scene as a California garage rock band, Eyeshine evolved themselves into an aggressive edge rock outfit during 2004. The southern California-based trio debuted in 2006 with the How About That EP, whose blend of raw, unpolished modern rock was further explored on their debut full-length, Red Stripes White Lights, which was well received by their steadily growing fanbase. The band expanded to a quartet in 2007 and hit the road performing shows across the US. Eyeshine released their sophomore full length album, My Paper Kingdom in early 2009. The band has continued to tour nationwide, acquiring fans from all across the globe. Band members include: Johnny Yong Bosch (guitar and lead vocals), Maurice Salmin (drums, piano, vocals), Polo Yazaki (lead guitar), and Ginny Eck (bass).